Taipei, Nov. 3 (CNA) President Ma Ying-jeou attended theinauguration ceremony of the Taipei mass rapid transit (MRT) system'sLuzhou Line Wednesday morning at Daqiaotou Station, where he offeredhis congratulations on the line's opening. Ma and Taipei City Mayor Hau Lung-bin took the new line bound forLuzhou at 10: 18 a.m. at Zhongxiao Xinsheng Station while Premier WuDen-yih and incumbent Taipei County Magistrate Chou Hsi-wei boarded atrain bound for Zhongxiao Xinsheng Station at Luzhou Station at 10:15a.m. Both groups arrived at 10: 25 a.m. at Daqiaotou Station, locatedat the midpoint of the Luzhou Line on the border between Taipei Cityand Taipei County, and crowds cheered as they shook hands andexchanged greetings. The line was to launch regular service at 2 p.m. Wednesday. It isexpected to handle an average of 170,000 passenger-trips per day andcut the travel time for commuters between Taipei City and Luzhou inTaipei County to the west of the city by at least half. Riders with EasyCards will be able to travel on the line for freeuntil Dec. 2. 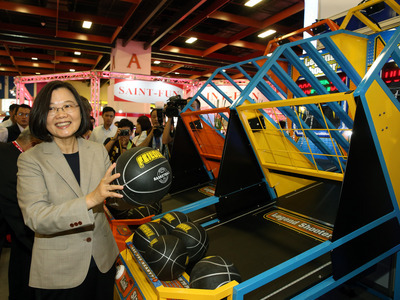 Construction on the line began eight years ago when Ma was mayorof Taipei, Taiwan's capital.